Access the Classroom Seating Chart by clicking on the Classrooms tab and Seating chart option. Create a grid of any size. Move the seats into any configuration by placing your cursor over the seat and dragging and dropping it where you want it to be. Do not move seats into the blank area on the left. To add extra seats, click Add One Seat. The new seat will appear on top of the existing grid. Drag and drop the seat wherever you wish. To delete a seat, click the small X in the upper right corner of the seat that appears when you hover over the seat. When you are satisfied with the layout, select Save layout. Note: A layout consists of an arrangement of seats. Only one layout can be saved per teacher. 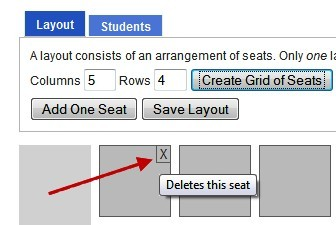 If you have two classes with different seating arrangements, create a grid that accommodates the larger of the two arrangements and do not delete seats from this arrangement. One layout applies for all of your classes so it can create a grid that is large enough to accommodate your largest class.